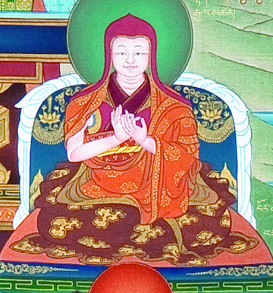 Ngor Ewam Chöden Monastery (ངོར་ཨེ་ཝཾ་ཆོས་ལྡན་, Wyl. ngor e waM chos ldan) — an important Sakya monastery, and seat of the Ngor subschool, established by Ngorchen Kunga Zangpo around 1430. The monastery was named Ngor Ewam Chöden because during construction Ngorchen Kunga Zangpo dreamt that the whole collection of dharma arises from the letters E (་ཨེ) and WAM (་ཝཾ་). Before being completely demolished during the Chinese invasion, it was a very active monastery, counting about 1,000 monks in the 1950s. It has only been partly reconstructed. Ngor Monastery was re-established in Manduwala, India. David Jackson, Sources on the Chronology and Succession of the Abbots of Ngor E-waṃ-chos-ldan, Berliner Indologische Studien. Band 4/5: 49-93, 1989. This page was last edited on 1 June 2018, at 06:15.